I have a quick story to share with you, so sit back, take 30 seconds to read the next 5 paragraphs, and if you don't learn something new that will benefit your business, you'll never hear from me again. So here I am, almost seven years into my online marketing career, looking at my experience in one hand, and the products I bought in the other hand, and I'm sighing, very, very loudly. I spent over $30,000 on these products, not to mention thousands of hours reading other peoples stuff, and you know what? There's a pattern that recently started emerging that I have no doubt will interest you. Check it out: After experiencing everything that I'd apparently been taught about online marketing first hand it became obvious. They only told me half the story. Man, that got me mad. Ever get that feeling.. It's that little feeling that you get when someone doesn't quite give you the whole picture. They tell you just enough to give you an idea, but you can somehow just tell that there's far more to be had and they're holding out on you. For example, did you know..
That your list, the all profitable list that almost every single marketer (aside from the few that know what they're talking about) is trying to tell you is the most important resource you can ever have, and should be *the* number one priority for you to be building if you ever want to be a success? They couldn't be more wrong. It's actually the 5th most profitable resource you have at your disposal. That your list on it's own is almost useless without the other four resources in place to prop it up? So here's the thing, if you're reading this right now, and the biggest thing in your mind is 'Must build a big list to be successful' or 'Need 30,000 subscribers to take home the $20,000 per month pay cheque I want' you have been miss-informed, like so many of us have been to the tune of tens of thousands of dollars (just like my example above). There's a lot more too. Much more. Here's the *full* story for you. • Have you ever caught yourself thinking that maybe, just maybe if you had a big enough list and enough people to promote to, building a new successful business every few months wouldn't too much of a problem? Well you'd be right, and it's far easier than you may think to get your hands on this type of promotion power. I'm going to show you 5 methods of doing so that won't cost you a cent. • Did you know that in complete contrast to all the list building hype that's been floating around recently, your list is actually your weakest resource? There's four more that are far more powerful, not to mention easier to get your hands on if you know how. Finally get your hands on the full story, not just a fifth of it. • Self replicating resources. What if I told you that it's very possible, not to mention rather easy to get your hands on a simple list of a 1000 subscribers. Not exactly much profit potential there you may think, but then what if I told you that you could multiply this figure 10 times without spending any of your cash at all? This is the beauty of self replicating resources. Promotion power at your fingertips that builds itself in a such a way that you never actually need to do any promotion yourself. We'll show you how. • Now what if I told you that the above example of gaining 10,000 subscribers from 100, for free was just one of the five resources we're going to be talking about, each of the other four being at least twice as profitable as your list. That's the equivalent of having 90,000 subscribers purely at your disposal at a conservative estimate. How much cash would you make if just a measly half a percent bought a $20 product from you each mailing? • Did you know that your previous customers are in my experience, more than 25 times more likely to buy from you a second time than they are the first? I'll show you one simple method that doubled that figure, and in fact had 86% of my previous customers buy from me through two consecutive and entirely separate products. • 86% of my customers bought from me a second time through two consecutive and entirely separate products, but that's not the full story. The second product cost a full 9 times more than the first, bringing the total to a massive 774% increase in sales through one simple method that I'm about to share with you. Best of all, none of these cost me a penny. • Why, why why? Probably the most important part of this course is that I'm going to tackle the why issues with you, as well as the how's. Knowing how to do something is the short term key to success, which is what the average course out there will provide you with. Knowing why something works will allow you to adapt and change your methods and keep changing with the times making sure your success doesn't fizzle out. On-going, long term techniques and methods we're talking here, not just one off stuff that's going to help you for a month until everything changes. Don't get left behind again. 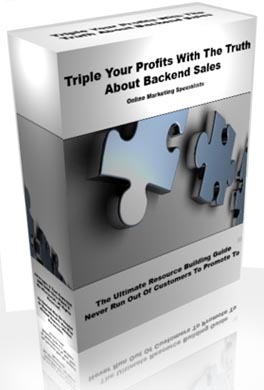 • Backend sales explained. How to avoid having to repeat the number one most expensive aspect of any business ever again. • Real world examples of backend sales. It's not just online marketing that uses these techniques, it's offline business too. I'm going to take you through some of the biggest and most high profile examples I can think of to all out prove to you once and for all that these methods do indeed work every time. • One simple method that shows my customers I care about them. While this is nice, it also has an effect of between 60% and 86% of them buying from me a second time through consecutive sites. What would it mean for your business to add 86% to your businesses profit every single time you launch a new product through the customers you're already in contact with anyway? It's powerful, it's profitable, and it's free (if done correctly anyway). • The five roles of backend sales that ensure the success of only the few in the know. If you're missing any one of these five, you're potentially cutting your profit in half five times. Take $10,000 per month and half it five times if you really want to see how much that hurts. • Promoting For No Profit. Learn how you can build and promote sites that will bring you no immediate money, but multiply your profit potential of future products as many times as you want as often as you want.